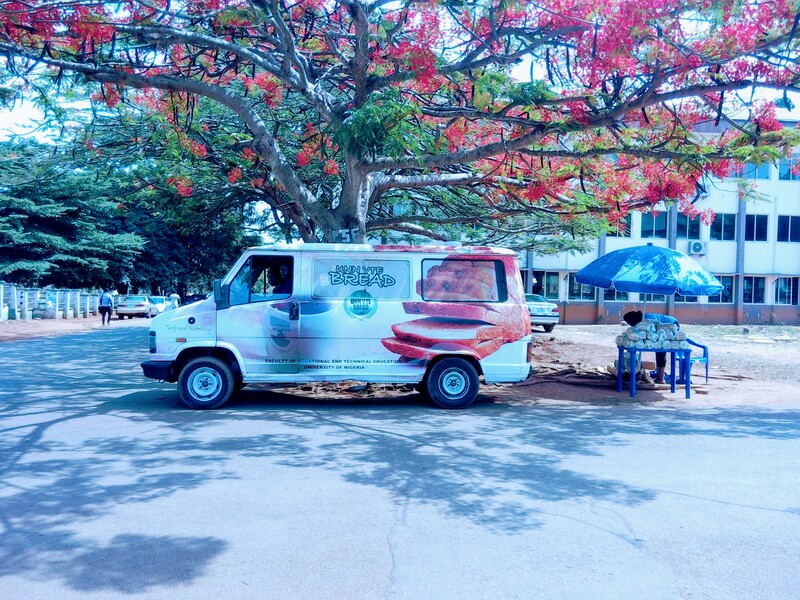 I was walking down from the Library to ICT Centre, University of Nigeria, Nsukka (UNN) when I spotted this van carrying the UNN VTE bread and distributing to retailers. Guess what I did? I requested that they let me snap the vehicle. Don’t mind me, blogging has turned me into a paparazzi. Lol. Well, the reason I took the picture was to let the whole world know, that the Faculty of Vocational Teacher Education, UNN now has a bread factory and operates at a large scale. Just recently, they changed the business name from ‘Lion Bread’ to ‘UNN VTE Bread’. I just bought one yesterday and it’s lovely. They actually bake different kinds of bread. Kudos to VTE, UNN.